And now the database is stuck in the restoring state. And exactly what you want in a catastrophic situation is a restore that won't work. You need to use the WITH RECOVERY option, with your database RESTORE command, to bring your database online as part of the restore process. This is of course only if you do not intend to restore any transaction log backups, i.e. you only wish to restore a database backup and then be able to access the database. You may have more sucess using the restore database wizard in SQL Server Management Studio. This way you can select the specific file locations, the overwrite option, and the WITH Recovery option. I had this situation restoring a database to an SQL Server 2005 Standard Edition instance using Symantec Backup Exec 11d. After the restore job completed the database remained in a "Restoring" state. I had no disk space issues-- the database simply didn't come out of the "Restoring" state. RESTORE DATABASE successfully processed 0 pages in 18.530 seconds (0.000 MB/sec). The database was usable again after those 18 seconds. which fixed the issue. I was having trouble at first because of the database name which contained special characters. I resolved this by adding double quotes around - single quotes wouldn't work giving an "Incorrect syntax near ..." error. This was the minimal solution I've tried to resolve this issue (stuck database in restoring state) and I hope it can be applied to more cases. OK, I have similar problem and exactly as it was in case of Pauk, it was caused by the server running out of disk space while restoring and so caused a permanent restoring state. How to end this state without stopping SQL Server services? There is also virtual restoring process, but you'll have to use 3rd party solutions. Usually you can use a database backup as live online database. ApexSQL and Idera has their own solutions. Review by SQL Hammer about ApexSQL Restore. Virtual restoring is good solution if you're dealing with large numbers of backups. Restore process is much faster and also can save a lot of space on disk drive. You can take a look on infographic here for some comparison. If you are taking a tail-log backup, this issue can also be caused by having this option checked in the SSMS Restore wizard - "Leave source database in the restoring state (WITH NORECOVERY)"
If the client who issued the RESTORE DATABASE command disconnects during the restore, the restore will be stuck. It's odd that the server, when told to restore a database by a client connection, will not finish the restore unless the client stays connected the entire time. I had a situation where my database showed restoring state and I couldn't run any queries and couldn't connect with our software. Stop all SQL related services from windows services. I copied both of these files to another folder. Then I started all the SQL related services (in step 1) again from windows services. Started my MS SQL Management studio with normal login. Right click on the culprit database and hit DELETE (to delete the database at all). All the LDF and MDF files related to this database have gone from DATA folder (mentioned in step 2). Created a new database with the same name (same name of the one I deleted in step 6 - the culprit database). Then [database name]->right click -> tasks -> Take Offline. I then Copied both the files (from step 3) back to the DATA folder (step 2). [database name]->right click -> tasks -> Bring Online. Then I right-clicked on Databases and selected Refresh which removed the entry in Management Studio. Afterwards I did a new restore which worked fine (note that bringing it offline did not work, a restart of the SQL service did not work, a server reboot did not work as well). Drop the DB with sql or right click on it in manager "delete" And restore again. I have actually started doing this by default. Script the DB drop, recreate and then restore. 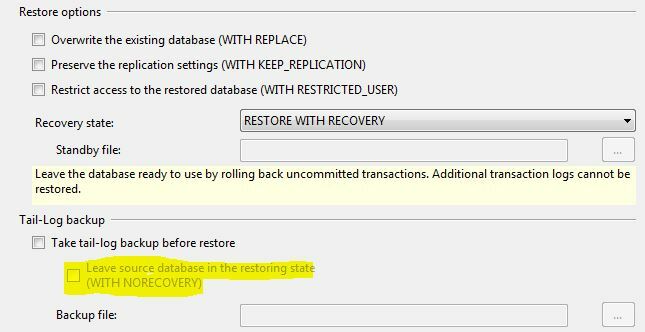 By default, every RESTORE DATABASE comes with RECOVERY set up. The 'NORECOVERY' options, basically tells the SQL Server that the database is waiting for more restore files (could be a DIFF file and LOG file and, could include tail-log backup file, if possible). The 'RECOVERY' options, finish all transactions and let the database ready to perform transactions. if your database is set up with SIMPLE recovery model, you can only perform a FULL restore with NORECOVERY option, when you have a DIFF backup. No LOG backup are allowed in SIMPLE recovery model database. Otherwise, if your database is set up with FULL or BULK-LOGGED recovery model, you can perform a FULL restore followed by NORECOVERYoption, then perform a DIFF followed by NORECOVERY, and, at last, perform LOG restore with RECOVERY option. Of course, you can perform a restore with the option STATS = 10 that tells the SQL Server to report every 10% completed. run command: drop database [snapshot database], and then run the command in step 2 again. Have you tried running a VERIFY ONLY? Just to make sure it's a sound backup. Let check and run SQL Agent Service firstly. All the WITH RECOVERY based options did not work for me. What did was to do the complete restore from Management Studio. I had the same issue... although I do not know why my database experienced this problem as my drive was not full... It's like it got corrupted or something. I tried all of the above none of them fully worked, I especially thought the suggestion to stop the service and deleting the mdf and ldf files would work... but it still froze up on restore? I ended up resolving this by deleting the files as mentioned but instead of trying to restore the DB again I copied over fresh .mdf and .ldf files and Attached these using the Front End Attachment wizard. Relief, it worked!! It took FOREVER to copy over the new files as I am using a Virtual Machine... so copying and pasting using the clipboard took like an hour itself so I would only recommend this as a last attempt. I have got the MyDbName (Restoring...) case because of SQL Express licensed limit. CREATE DATABASE or ALTER DATABASE failed because the resulting cumulative database size would exceed your licensed limit of 10240 MB per database. So if you are trying to restore a bigger database, you need to switch your SQL Express server to Developer edition for instance. Great discussion. The most common mistake which maximum users do is to restore the database with recovery option having multiple backups. This makes the database into RESTORING state. If you are doing point in time recovery then first go with the Restore with NoRecovery. With the last backup option, you need to use Restore with Recovery. Read reference1 and reference2 about backup and restore. How to stop a restore of a database with Microsoft SQL Server 2005? Failing to restore a SQL database from Snapshot. Why Sql Server Database froze on restoring? How do you backup and restore a database as a copy on the same server?